(Public Information, Onitsha Nigeria, 19th of November, 2013)- Though, we have resolved to speak categorically and extensively on the referenced after the conclusion of the fixed supplementary poll in respect of Anambra Governorship Poll, but this statement is to flash the minds of reasonable and conscionable Nigerians on “how the hunters have turned against themselves and begun to reap from what they sowed”. The Lagos hunters have resorted to coordinated media warfare against the People and Government of Anambra State over their last Saturday's sacred decision in choosing their next governor come March 17, 2014; though it is said to be “inconclusive” for now. The attacks are coordinated by the APC, peopled by its southwest political dominators. We have spoken severally that the respect and integrity attached to hitherto ennobled Nigerian media died after the anti-military struggle in 1999. What is left of the media, particularly the print and audio/visual of the Southwest extraction, is nothing but an “ethnic jingoist mouth piece”. If Anambra Governorship poll outcome had gone in their favour, no matter how dirty, it would have been a celebration galore for them. Before the poll proper, we advised the APC to learn from its horrible mistakes in the Ondo governorship poll of 2012. There is a limit to media propaganda and falsehood. Credible polls are no longer won on the basis of media falsehoods and false alarms. Our advice at all times to those in the corridors of electoral power is to concentrate less on “governance by media or falsehood or propaganda” and pay most attention on socio-economic governance because the best formula to win popular votes lies therein. 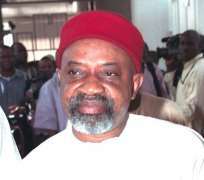 One of the reasons that make Dr. Ngige to lose election is “rented crowd”, which makes it difficult for him to know his real supporters and followers. Though his camp seemed to acknowledge this warranting it to send the following sms to its suppoters: “it is not enough to say Onwa is popular, make him truly popular by voting him as your next governor”. Anambra is not made up of two LGAs, but 21. The unfolding events from the Anambra Governorship Poll are not far from the Obiano's alleged voter double registration propaganda and falsehood, quashed by a high court recently. In law, when facts grounded in law, speak; others are nailed in the confine. In law court, “orbiter dictum or dicta” (non court verdict binding remarks), no matter how lengthy or quantitative, cannot invalidate or take precedent over “ratio decidendi”(reason for deciding or binding court verdict speech). That Dr. Alex Ekwueme's or Chief Gani's voter data were found doubly in Oshun and Anambra State in 2007 cannot earn them “malicious double registrants”, until circumstances are properly scrutinized to find out if they actually registered doubly or whether it has to do with administrative incompetence on the part of INEC. Lapses that cannot affect the poll conduct and its outcome both administratively and judicially are: low voter turnout, missing names in the voters' register, late arrival of voting materials provided voting eventually takes place and is conclusive, pockets of hitches not amounting to violence and massive irregularities, and cancellation of results in few polling centers. These lapses are morally and administratively condemnable, but not legally answerable, especially as per the entire poll results' cancelation. Court decisions cannot be predicated upon them, though they may tongue-lashed under the Judge's “orbiter dictum”. In summation, they do not amount to “substantial non-compliance” with the provisions of Electoral Act of 2010. On the other hand, lapses that can affect the poll conduct and its outcome are: substantial violence on poll day leading to deaths and property destruction, production of poll results from the areas where poll do not take place, massive irregularities including snatching and stuffing of ballot boxes, thumb-printing or writing of results in areas other than designated polling centers, declaration of poll results not obtained from polling centers, deliberate omission of contesting candidates' names and photos etc. This is what is termed “substantial non compliance” with the Electoral Act of 2010. In the Anambra Governorship Poll, complaints were that “materials came late in some polling centers”, “Obosi Ward 7 with 65 polling centers did not vote or refused to vote because voting materials came very late”, “some voters including the PDP candidate could vote because their names were missing from the voters' register”, “monies were shared by politicians to induce voters”, “ the Idemmili North EO compromised the process by delaying the deployment of voting materials to the area on time”, “ polling centers where there were disturbances including beating of INEC staffs and results manipulations, have their results cancelled,” with a total voting population of 113, 113. Of all these, no major violence and massive irregularities were reported. The INEC has apologized over its lapses and announced the arrest of the “compromised staff” in the Idemmili North. The poll has been conducted in the 65 polling centers in the Obosi Ward 7 where it did not take place on poll day. All the areas with compromised vote results have been scheduled for a supplementary poll. As for the missing names in the voters' register, though condemnable, but poll results, in the eyes of the law, cannot be cancelled on the basis of that. Its blame is a three-way thing; INEC, political parties and the registered voters. On the political parties' part, they dashed the opportunity given to them by INEC since 16th of October, 2013 to verify same and report back as per missing names and other lapses. Instead, the likes of APC turned its own into “house to house hunting and procurement of prospective voters”. On the part of registered voters, many stayed away during the officially conducted voters' revalidation exercise two months ago; the likes of Mr. Tony Nwoye possibly inclusive. Others who registered outside their homes during the main registration exercise saw it as laborious going there to vote on poll day or getting theirs transferred to the polling centers located close to their residences. On the part of INEC, its inability to provide enough registration machines and personnel forced people during the exercise to go to places with ease to get registered. The same administrative incompetence played out during the revalidation exercise, whereby machines and personnel provided were very few, which made the Commission to restrict it at ward levels. Can INEC cancel already announced poll results? The straight answer is no! Once results are declared and announced at polling units, wards, LGAs and State's levels, they cannot be reversed or cancelled by the Commission, except by the court after competent judicial review. Calls for annulment of the Anambra Governorship Poll results, already announced by INEC, is practically impossible under the present democracy and its body of laws, except under a military government; akin to the June 12 Presidential Poll results annulled by the Babangida's military's inglorious epoch. The stark truth is that “the hunters have turned against themselves”. The Evil that Men Do has returned to its doer. Those who stormed Anambra State with all known poll rigging machineries including media weapons, poll room analysts, “Amala bowelled” rights activists, “dependent” poll observers, poll riggers who masqueraded as “poll observers” and camped in various hotels in Owerri and Anambra; were shocked, alarmed and dumbfounded over another possible poll humiliation after that of Ondo 2012. Their camp leaders bought tens of thousands of voters in across residences in the State, hoping to use them to take over the Igbo Land, yet they rejected the evil offer and voted conscientiously. Today, they have relocated to the media houses and offices of the so-called “rights groups”, headquartered in Lagos, seducing and inducing them to turn their arsenal against the innocent Anambra residents. They may have their media and other warehouses of falsehood, but the Anambra People have their God, gods and goddesses with hereditary staff of justice, truth and equity. We were further shocked and alarmed when some Igbo-Lagosians put calls across to us on Saturday evening, telling us that it was “owambe” party all over the place in some streets of Lagos among their Yoruba brothers and sisters, saying “they have taken over the Igbo Land” and “Jonathan and Ojukwu are finally dead and buried”. We remain eternally grateful to courageous Anambra Voters and appeal to them to ignore the ongoing media war against their sacred electoral decision. They should see most of the headlines dominating the Nigeria media as they concern Anambra's Governorship poll as propagandist and ethically engineered. They should search for, read and digest objective news items usually found in the inside pages and ignore the misleading, concocted and falsified ones usually put on the front pages. Anambra is, indeed, a pace setter in popular poll science and no amount of sectionalized and sensationalized media reports can blacken or darken this globally enviable feat. Igbo god and goddesses are not asleep!! !